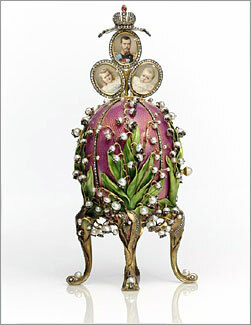 A Faberge Imperial Easter Egg presented by Tsar Nicholas II to his wife the Empress Alexandra Feodorovna at Easter 1898. Over the next years (1897), Nicholas and Alexandra increasingly insulated themselves from politics and the intrigues of the court. 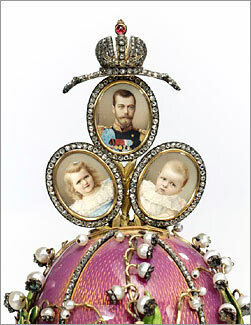 So Faberge made a point of learning something of the private lives of his most important clients. 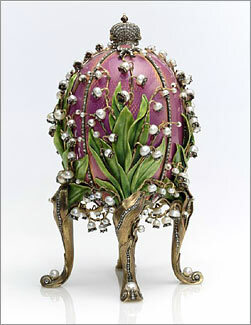 He knew that pink was the favorite color of the Empress, and lilies of the valley her favorite flower. Every spring, Alexandra had the rooms of the palaces filled with beautiful floral bouquets. 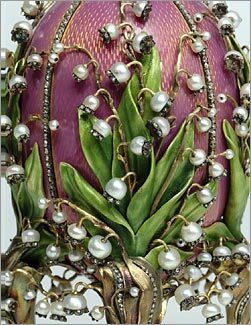 The Lilies of the Valley egg (1898) is a translucent pink-enameled treasure covered with gold-stemmed flowers made of pearls, diamonds and rubies. One flower, when turned, releases a geared mechanism inside to raise the fan of tiny miniatures from the top - portraits of the Czar and his first two daughters, Olga and Tatiana. Был объявлен аукцион: Sale N07981 April 20-21, 2004. Но аукционному дому Сотби сделали предложение, от которого он не мог отказаться. О сенсационной продаже-покупке было объявлено 4 февраля 2004 года. Теперь всем нам предоставляется возможность полюбоваться этой красотой. Надеюсь не только на фотографиях, но и в живую. Обещают показать даже в Ижевске. Now the opportunity to admire is granted all of us this beauty. I hope not only in photos, but also in alive. Promise to show even in Izhevsk.